Dragon’s Den came to The Sixth Form College, Solihull last week, as Business students faced a panel of dragons in the annual ‘Dragons Den’ style event, sponsored by Key Construction (Midlands) Ltd and West Hart Partnership. Three students presented their business plans to a panel of judges, which included Bernard Callinan (Managing Director of Key Construction), Jim Hart (ex-student, now running his own architectural practice called West Hart Partnership), Mutrice Bedford (HR Manager) and Peter Brown (Procurement Manager at the College). They listened to the students deliver a 15-minute presentation of their business ideas, before firing questions at them to see how they handled cross examination. The winning presentation was delivered by Kim Gillard-Pee for her vegan bakery business idea named ‘Cherry on Top’. She received a gold certificate and £200 and will also be presented with a trophy at the end-of-year College Awards Evening. Second was James Leckie for his gym business idea named ‘The Old Skhool Gym’. He received a £100 second place prize, along with a silver certificate. 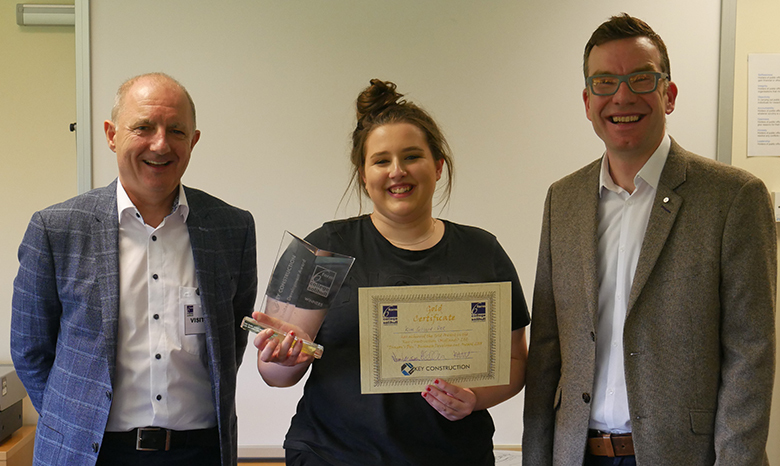 In third place was Saarah Zaman for her organic make up brand business idea named ‘Make-up Organz’ and Saarah received a prize of £50 and a bronze certificate.